A uniquely balanced blend of Cordyceps and Reishi, CordyChi brings the benefit of supporting energy and oxygen uptake with cellular nutrients. Adults with active lifestyles and those who seek balance in a stressful world will breathe easy with CordyChi. 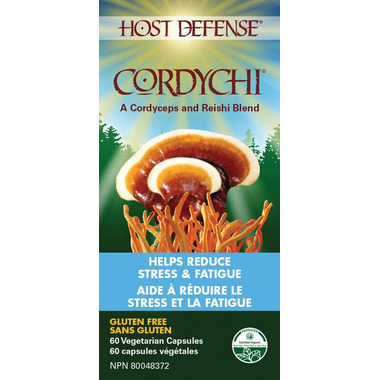 Host Defense CordyChi uses activated, freeze-dried, Certified Organic mycelium, with a full spectrum of constituents: polysaccharides (beta glucans, arabinoxylane, glucose, xylose, galactose and cordycepic acid), glycoproteins, ergosterols, triterpenoids and other myco-nutrients, which are essential for Supporting Natural Immunity. Serving Size: 2 capsules. Directions for use: Take 2 capsule once per day. Can be taken with food or without, on an empty stomach or as recommended by your healthcare advisor. Cordyceps mycelium, Reishi mycelium, freeze-dried myceliated brown rice, Pullulan (an extra-cellular polysaccharide). Consult your healthcare advisor regarding the use of this product during pregnancy. Keep out of reach of children. My Naturopath recommended I take this to help improve my kidney function, my lungs and to increase energy. After the first week i had a decrease in fluid retention, my energy increased without feeling jitters or over stimulated. It was just a shift from low energy to, wow my stamina has increased. My lungs were no longer affected by allergens at all. I could breathe so much better and my immune system became stronger. I was not catching the colds or flus that were infecting people close to me. I did notice if I took it past 5pm it disrupted my sleep. So try to get it in before that. Great product to help support your immune system and increase energy when guided by a natural health practitioner.